The DiaEx diamond exchange has attracted interest from various stakeholders in the multibillion dollar diamond industry. Professional diamond traders realize that, this is the first major, improvement for the industry in decades. In recent weeks we have received a number of queries, from operators of diamond mines in Russia and Africa. They seem to be puzzled why, rough diamonds were kept out of the DiaEx trading platform. The Glitzkoin team includes two senior experts from Russia. Olga Rosina one of the diamond experts on the team, has been in the diamond industry for around two decades. She has worked with two of Russia’s largest diamond mining operators. Mikhail Kozlov, well known Russian business strategist and politician, graces the Glitzkoin advisory board. Back to the issue of rough diamonds in the Glitzkoin exchange. Rohit Agarwal, advisor to the tech team clarifies that, ‘… there is no technical limitation that requires, rough diamonds to be excluded from the DiaEx trading platform …. It has more to do with, the nature of rough diamonds and other business related issues …’. Olga Rosina is the right person to clarify the issue related to rough diamonds. She explains that, ‘… it is not easy to develop and implement, a globally accepted standard for accurately describing rough diamonds…’. She clarifies that, the 4C parameters used to describe a diamond, are not applicable to rough diamonds. The DiaEx diamond exchange is designed to facilitate global trade in diamonds. Buyers and sellers located at any location on the globe, can transact directly on the platform without, the need for brokers or middlemen. Every diamond that is listed on the exchange, will need to be certified. Certified diamonds have an accurate and unbiased assessment of the 4C parameters. The certification process also rules out trade in fake and synthetic diamonds. Second generation diamond veteran and Glitzkoin promoter Navneet Goenka, has clarified on several occasions that, there would be no room for synthetics and fakes on the DiaEx platform. Diamond certification from reputed testing labs is so reliable that, trade transactions are often finalized based solely on the certificate. The unique nature of each piece of rough diamond is so glaring that, even professional buyers prefer to see the actual stone before making a purchase. 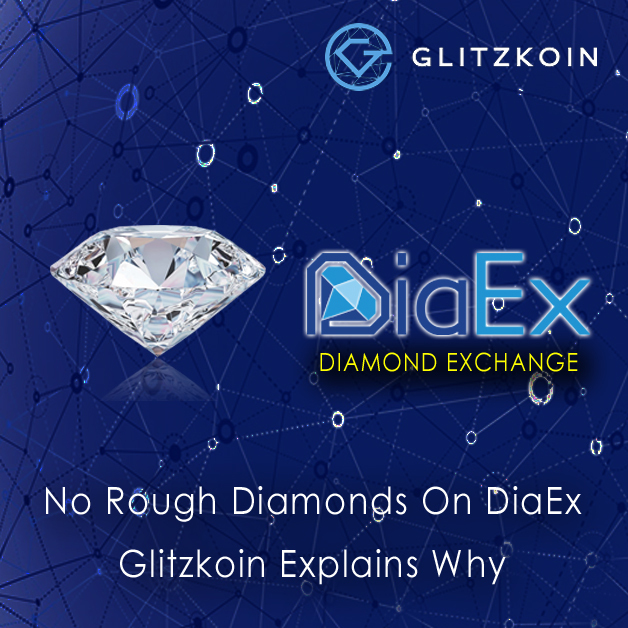 Diamond expert and CEO of Glitzkoin, had this to say about the possibility of including rough diamonds on the DiaEx platform in the future, ‘… the change needs to come from within the industry. An objective and verifiable classification of rough diamonds, needs to be developed and implemented. Once this happens, rest assured that DiaEx would open up to rough diamonds…’.